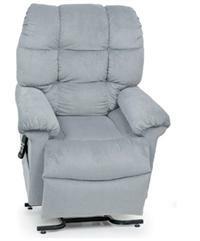 Large comfortable captain seat with adjustable depth, height and width arms. 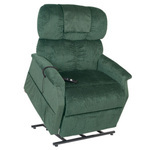 Both seat styles come standard swivel, reclining, and adjustable height with sliding depth. Easy to adjust tiller. Features "Free Wheel" mode where scooter can be moved manually. 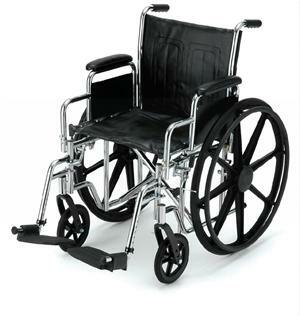 Comes standard with anti-tippers, head and rear lights and shock absorbers. 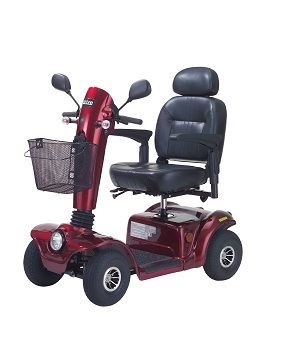 Top speed 5.6 mph with indoor and outdoor speed mode. Cruising range 15-20 miles. Fully adjustable suspension. 10" pneumatic tires. Comes with batteries. Front basket and mirrors standard. 4 amp off board charger for quicker charge. Full lighting pkg w/active brake lights. Electromagnetic brake. HD 110 amp electronics and HD motor. Has been tested and surpassed the ANSI RESNA testing requirement. Weight Capacity: 400 lbs.